Confetti Magic are delighted to have sponsored and helped @DevisesOutdoorCelebratory Arts with the biggest and best confetti battle to date. 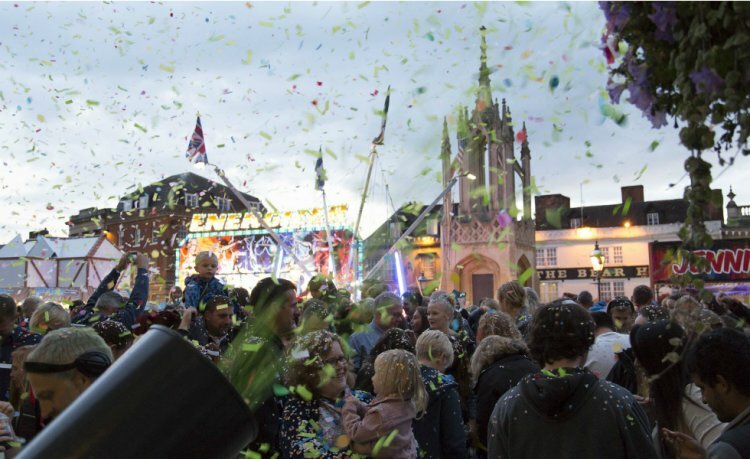 With a history dating back over 100 years, the current ‘battle’ – actually just an excuse to have a lot of fun throwing coloured paper at each other – takes place during Devizes Festival Fortnight. This year saw Confetti Magic supply the intriguingly named Turbo Confetti Blaster and CO2 Hurricane Confetti Gun; and, of course, confetti. With the event lasting half an hour, the Turbo Blaster is perfect to create a continuous stream of confetti as the participants throwing handfuls of confetti, creating a vibrant sea of colour - one which, the smaller members of the audience, have great fun making confetti angels in. This year, the audience was treated to the bizarre spectacle of two clowns suspended above the crowd, hurling clouds of confetti at each other. As the fallout from their fight cascaded over the onlookers, a third clown armed with a Hurricane Confetti Gun, stalked the crowd, surprising them with a whoosh of CO2 and confetti. We think it’s a wonderful event and a fantastic example of British eccentricity and look forward to supporting it as it goes from strength to strength.